Who loves hot wings?! I know I do! I can devour a plate by myself if need be but we all know that is not the healthiest of decisions. In an attempt to make a healthy take on hot wings I found a great recipe that I wanted to share with you that I know you will love as much as I do. -In a small bowl combine flour, water, garlic powder, and salt and mix with a whisk. -Bake for 10 minutes until the batter hardens and flip the pieces and bake for another 5 minutes. -Whisk together hot sauce and butter in a small bowl. 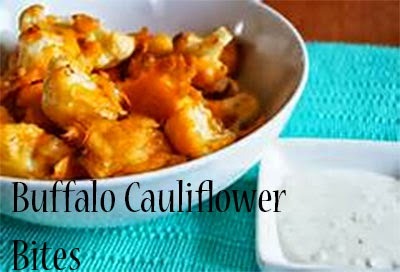 -When the cauliflower is don, take a brush and brush each piece with the hot sauce mixture. -Bake cauliflower for an extra 8-10 minutes until crispy. -Remove from oven and let the bites sit for 20 minutes,. These were so tasty, delicious, and light! Have you ever made these before or made something similar? I actually have this pinned on Pinterest and I haven't made them yet. Glad they were good. I need to break out this recipe and make it already! G'day! These look delish! I wish I could try now!